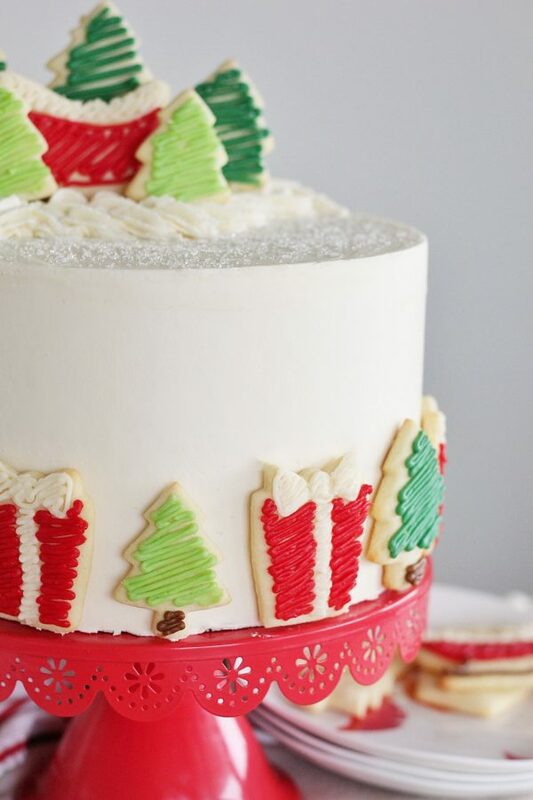 Santa’s Milk and Cookies Cake – vanilla cake layers with vanilla buttercream, sugar cookies and boiled milk frosting. I’ve been having so much fun revisiting some of my old holiday cakes, but it’s time for a brand new flavor today! 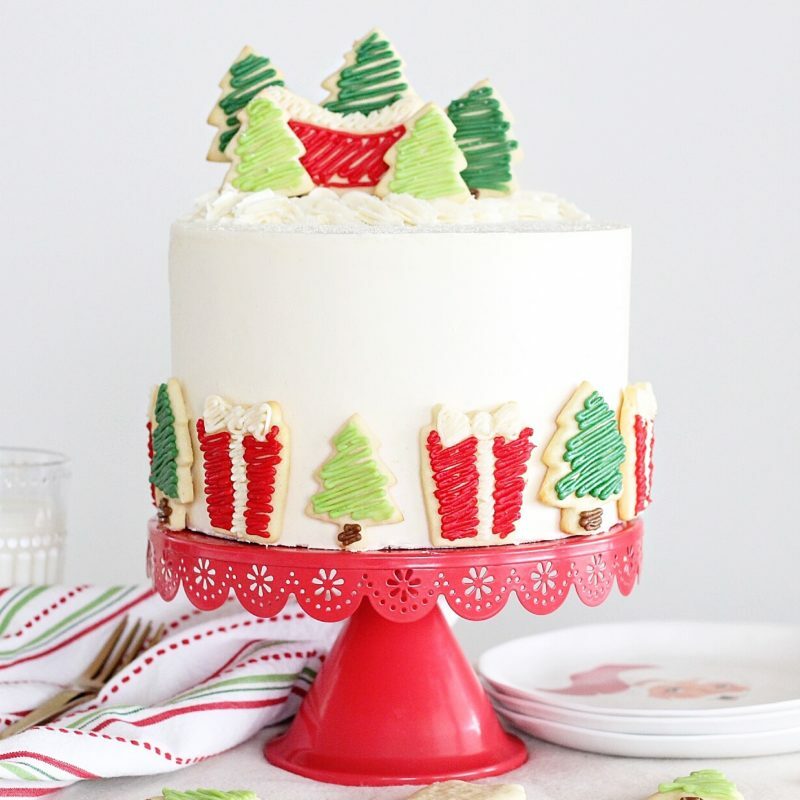 Let me introduce you to my Santa’s Milk and Cookies Cake! Like many of you, Christmastime is my favorite time of year. I love the music, the decorations, the shopping, the treats, but most of all, I love the time with my family and our traditions. More than any other holiday, Christmas brings with it my favorite family memories that have been built upon traditions we started when I was a kid. And while my family has changed a lot over the years, which means many of our traditions have changed, the one tradition that stays the same year after year is that of decorating sugar cookies for Santa. Cookies have always held a special place in my heart because they were the first baked good I felt like I mastered. At a young age, I loved being in the kitchen with my mom making a batch of chocolate chip cookies or rolled sugar cookies. Sugar cookies especially were so fun to make because we could create something different each time. Hearts for Valentine’s Day, shamrocks for St. Patrick’s Day, pumpkins for Halloween, and of course, trees, stars, bells, and snowmen for Christmas. Our Christmas sugar cookies always became part of a plate of cookies we’d gift to our neighbors. We also always saved our favorite decorated cookies for Santa, which we left out with milk and a note. Sometimes we even remembered the reindeer and left carrots alongside the treats. 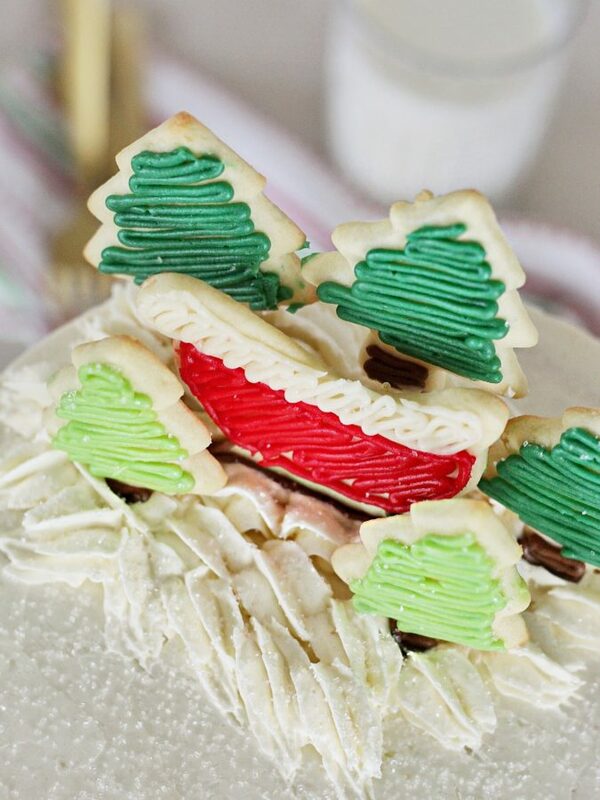 As I was thinking about Christmas-inspired cakes this year, I couldn’t help but wonder how I could turn this beloved Christmas cookie into a cake. The obvious idea might be to simply combine a vanilla cake with vanilla frosting, but I never like to go with the obvious 😉 Nope. Not me! My first thought, actually, was, “I have to include my favorite Sugar Cookie Recipe!”. These cookies are hands down my favorite sugar cookies. They’re soft and tender, and hold their shape nicely. I decided to bake up two 8-inch round sugar cookies and include them as layers in the cake. You’ll see I noted this in the recipe, but it’s important you don’t over cook the cookies. We want them to be nice and soft when you cut into the cake. I also chose to use two frostings in this cake. The first is my traditional vanilla buttercream – just like the one you’d want to eat on a sugar cookie. There’s plenty in the recipe for the inside of the cake, as well as for frosting your extra sugar cookies. I also included a boiled milk frosting to represent the milk. I love that this frosting is far less sweet than a typical American Buttercream, actually has a milk flavor, and turns out so white. Isn’t it gorgeous?! 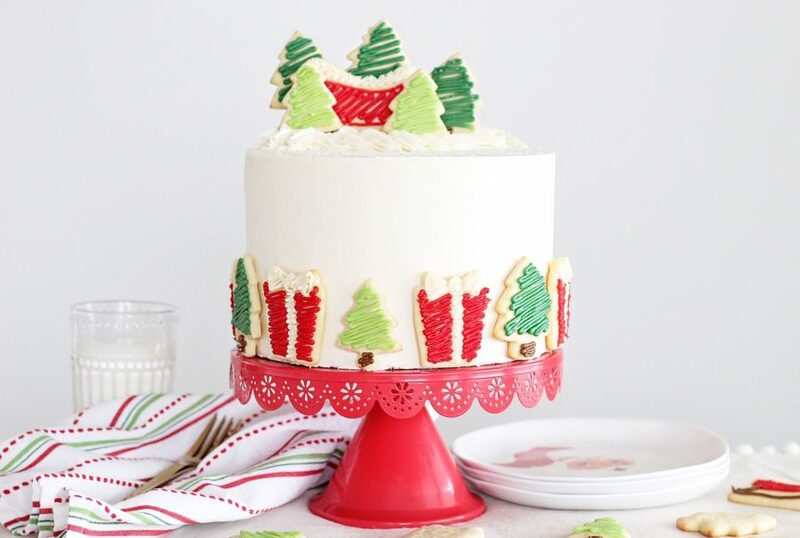 I think you’ll love the subtle flavor difference between the two frostings, as well as the texture combinations of the cake and sugar cookie. I really have a feeling a slice of this cake might end up on a plate next to your fireplace. Pretty sure Santa will approve! 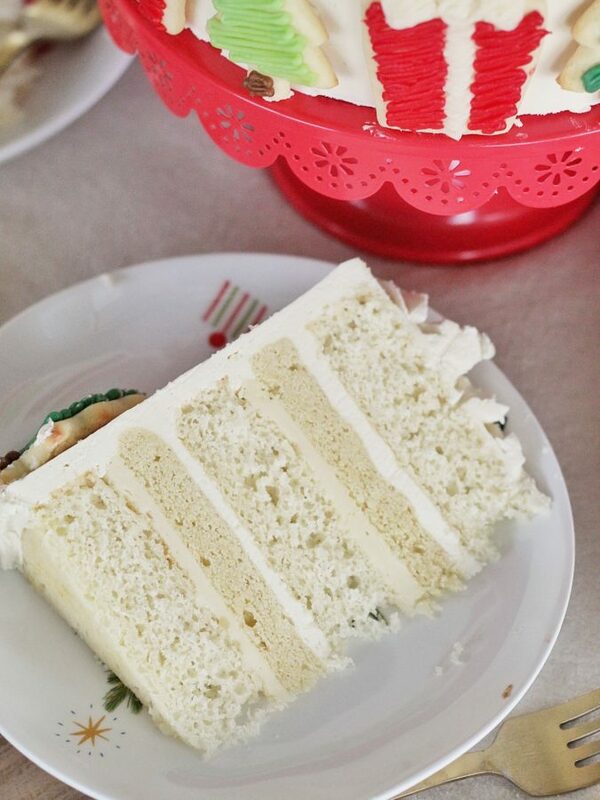 Vanilla cake layers with vanilla buttercream, sugar cookies and a boiled milk frosting. *Can substitute use 1 3/4 cup granulated sugar that you grind to a finer consistency in your blender. Preheat your oven to 400 degrees F. Pre two 8-inch round baking pans with nonstick spray, parchment paper and spray again. Set aside. In the bowl of a stand mixer fitted with the paddle attachment cream the butter and sugar until light and fluffy, about 2 minutes. Add the eggs and vanilla. Mix until incorporated. With the mixer on low speed, add the flour, baking powder and salt. Mix until just incorporated. Measure out 10 ounces of dough for each of the two cake pans. Using your hands, push the dough out to the edge of the pan (doesn’t need to be touching, just try to create an even circle). Bake the two large cookies for 7 to 8 minutes. When you take the cookies out, they shouldn’t be golden brown. We want the cookie to come out still light in color so it’s nice and soft in the cake. For the rest of the dough, roll the dough out to about 1/4 inch thick. Use cookie cutters to cut shapes and place the cookie dough 1 inch apart on the baking sheet. Freeze the cut dough for 10 minutes and then bake 5 to 7 minutes (time will depend on the size of your cookies). Using a kitchen scale, divide batter evenly among your pans (about 15 ounces of batter in each pan), spreading evenly with a small offset palette knife. In the bowl of a stand mixer fitted with the paddle attachment, beat the butter on medium speed for about 2 minutes, until light and fluffy. With the mixer on low speed, gradually add the powdered sugar, heavy cream, vanilla and salt. Turn the mixer to medium-high speed and beat the frosting for an additional 5 minutes, until nearly white. Before frosting or piping, mix the frosting by hand with a wooden spoon or spatula to push out the air pockets. In a medium saucepan, whisk together the flour and 1/2 cup of the milk until smooth. Set over medium-high heat and let cook for 1 to 2 minutes or until slightly hot, stirring frequently. Whisk in remaining milk and salt. Whisk constantly until the mixture has thickened to the consistency of unset pudding (this can take up to 10 minutes). Place in the refrigerator until cool for at least an hour. When cool, the mixture will be thick like custard. If a film formed on top of the mixture, remove it from the bowl. In a large bowl (or a bowl of a stand mixer) beat the butter and sugar together until fluffy. Add vanilla and mix well. Beat in cooled flour mixture one tablespoon at a time on medium-high speed. When all the flour mixture is added, beat on high speed until light and fluffy, about 6 minutes. Rub a little frosting between your fingers. If the sugar granules remain, beat for 4 more minutes, or until granules cannot be detected with fingers. Place the first vanilla cake layer, top side up, on a cake board. Spread about 3/4 cup of the vanilla buttercream over the cake layer. Top with one layer of the sugar cookie rounds, followed by about 3/4 cup of the boiled milk frosting. Repeat step 1 for the second cake layer and cookie layer. Place the third cake layer, top side down, on top of the second layer of boiled milk frosting. Apply a thin coat of the boiled milk frosting around the entire cake to lock in the crumbs. Freeze the cake for 10 mins. After the crumb coat is set, apply the final coat of the boiled milk frosting. To get an extra sharp edge and straight sides, you can place an acrylic disk or extra cake round on top of the crumb coat. Once the acrylic disk is in place, frost and smooth the sides of the cake. Freeze the cake for another 20 minutes. At this point, the frosting will be a bit more set and you'll run a knife under the acrylic disk to "cut" it off from the cake. You'll have a nice crisp edge. Fill in the top of your cake with more of the boiled milk frosting. Use remaining cookie dough to create shaped cutout cookies to decorate the sides of your cake.